Amethyst is a member of the Quartz family. Quartz is a mineral, the most abundant on earth, and not only does it make up around 12% of the earth’s crust, it is everywhere. Even those of us who are not living under a rock 🙂 have quartz all around, perhaps without realizing it. 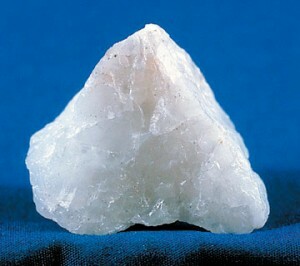 Your TV, computer, watch, cell phone and granite kitchen counter top all contain quartz. Quartz is commonly divided in two groups – Macrocrystalline (which has visible individual crystals) and Cryptocrystalline (which has crystals you need a microscope to see, sometimes also called Microcrystalline). Amethyst is the purple variety of quartz, and it is part of the Macrocrystalline group. 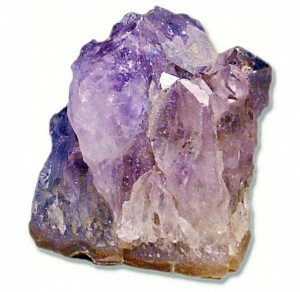 Amethyst is the birthstone for February (except for in the Mystical tradition, where it is Bloodstone. We will cover Bloodstone in the March birthstone post, because it is the birthstone for March in several other traditions), the astrological birthstone for Aquarius, Pisces, and Sagittarius and the 4th, 6th and 17th wedding anniversary gemstone. It has been known and used “forever”, and it was one of the stones in the breastplate of Aaron. It is mainly found in Brazil; other locations include the US (Arizona), Canada, Mexico, Bolivia, Uruguay, Germany, India, Sri Lanka, Madagascar, Namibia, Zambia and Russia. Amethysts range in color from pale pinkish purple to deep violet and they are the most popular of the quartzes. In spite of that, they are very affordable (the darker the stone, the more expensive it is, generally), and if you’re shopping for the high end variety, you want to look for nice, clear transparent stones without inclusions (i.e. things like bubbles, crystals, graininess, cracks etc. inside the stone). In jewelry, you most often find them faceted or cabochon cut. Amethysts are sometimes heat treated to alter the color slightly, and when lighter varieties are exposed to heat, they “turn into” citrine (so most citrine on the market is amethyst that has been heat treated). 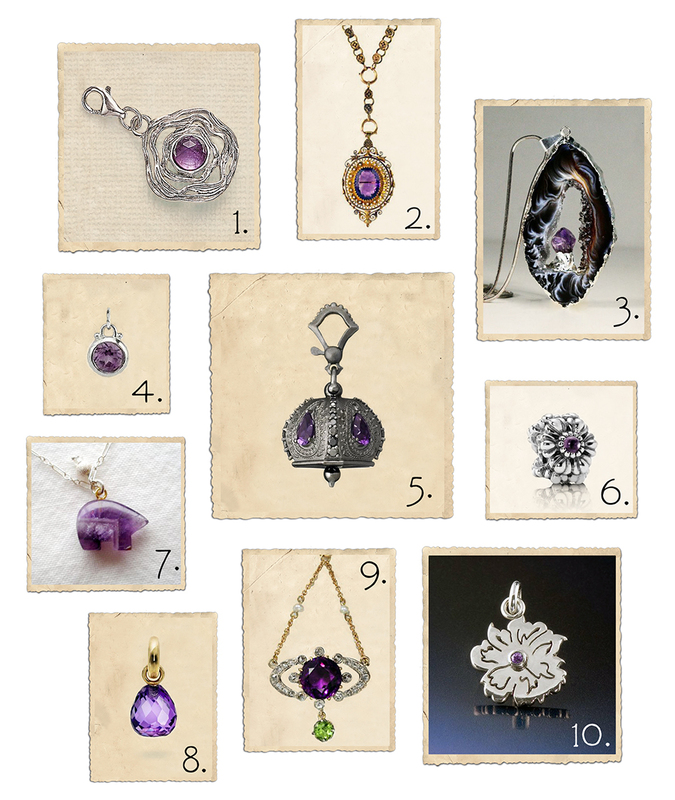 The ancient Greeks thought amethyst could prevent intoxication and instill a sober mind. The name comes from the Greek “amethustos”, which means “not drunk”. In traditional dramatic Greek fashion, there is the story of Bacchus (a.k.a. Dionysus) and the young maiden Amethyst. A mortal had insulted Bacchus, who as revenge decided to let tigers go after the next human who happened to come along. It turned out the be Amethyst on her way to worship the Goddess Diana. Diana knew of Bacchus’ plan and to spare Amethyst turned her into a quartz pillar, which made Bacchus so remorseful that he wept tears of wine, which turned the now quartz pillar Amethyst purple. Amethyst is one of the most important stones in crystal healing, believed to get rid of negativity and promote a more positive view on life, protect its wearer, aid in meditation, help when going through major life changes, heal a broken heart and make the wearer able to trust others and fall in love again. It also helps with addictions, stress, nightmares, insomnia, anger, grief, and feelings of being victimized. On a physical level, it alleviates arthritis and balances the thyroid, helps with headaches and strengthens the skeleton. And it might be worth it to invest in some amethyst jewelry even if it’s not your birthstone. Crystal Energy Therapist Karen Ryan says “If you could choose only one crystal to wear for healing, Amethyst is the one – it heals all things at all levels”. Lovely post, thanks for featuring my bear charm necklace!